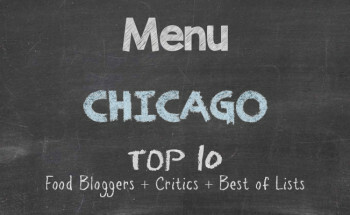 When I first moved to Chicago, the restaurant suggestions I had received other than the stock recommendations for catfish shacks, chicken houses, and rib joints were for Italian and Polish restaurants. Fast forward sixteen years and those recommendations have since changed, Italian and Polish not being bandied about as cultural flavours for the palate. With me also being primarily vegetarian — and I will admit that I have weak moments at times — African, Asian, and Middle Eastern cuisines have become a primary staple in my diet. Amid a multitude of eateries, there are some that seem to scream out to me — Indian restaurants being at the top of my list. 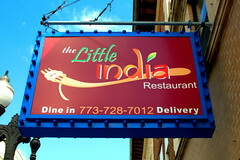 A few weeks ago when I was going to Rogers Park to see my god uncle, I caught sight of a sign for an Indian restaurant at the Berwyn Red Line stop. The Little Indian Restaurant at 1109 West Bryn Mawr Avenue was clearly visible from the platform and I had quickly logged a date into my cell phone to notify me of an adventure to take to the restaurant. No trip to Devon Avenue in West Rogers Park was required. All I had to do was make my way over to Uptown for a taste of some familiar and smile-inducing flavours. The Little India Restaurant is more like a cafe with a few tables, nothing akin to the vast restaurants with seating for banquets. Bright on the inside and practically under the rumble of the Berwyn Red Line stop, it is an appealing little stop for food satisfaction on the way home, to a friend’s house, or to wherever. Because Indian food can be very hearty and I wanted to sample a few items from the bill of fare, I opted for appetizers. For a beverage, I ordered a mango lassi. 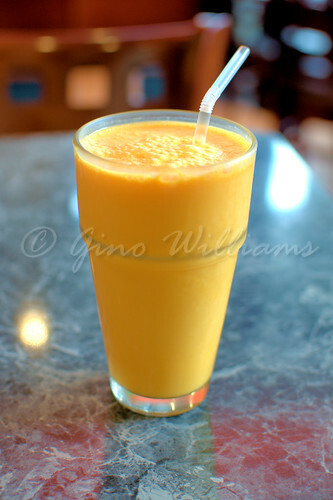 Let me just say that I am in love with mango lassies, and I have yet to have one from any Indian restaurant or street vendor that left me aghast with disappointment. This yogurt drink with mango and rose-water was perfect for this sunny, summer day. In keeping with dining culturally, I requested to have my three appetizers come to the table individually instead of all at the same time. 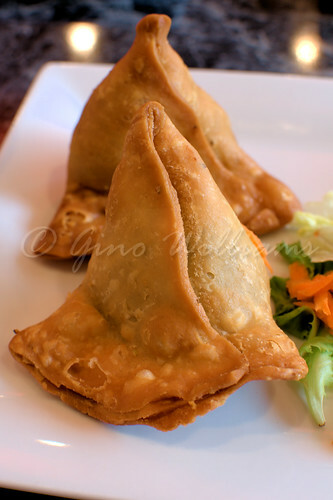 First were vegetarian samosas. These appetizers are Indian delicacies that I have not had botched either in all of my years of eating Indian food. Curried potatoes and peas stuffed inside of flaky pastry shells that are shaped like fist-size tear drops really left a smile on my face. I sliced them open, not particularly meticulously, and poured tamarind chutney across one and a spicy mint yogurt across the second one. With each bite there was a sigh, a brief smile, and then a huge grin — satisfaction at my window seat for all the see. Next to the table were ragda patties. This is truly a dish representative of street food. 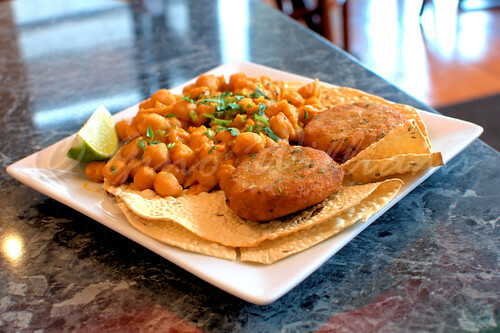 These fried curried potato patties served with chickpeas prepared chana masala style reminds me of the overload I had numerous evenings at a certain Indian restaurant named Benares in Berkely Square in London. And Chowli as well as Imli come to mind, and I am asking myself why I won’t just move back to London. The ragda patties served over papad papadum, which are thin spicy lentil wafers, were the highlight of my appetizer selection. I was practically rumpled and on the floor giddy with pleasure after finishing that dish. Third and final to the table was a plate of paneer chat. By now, I was slightly stuffed and knew that I would only get through half of the third appetizer. 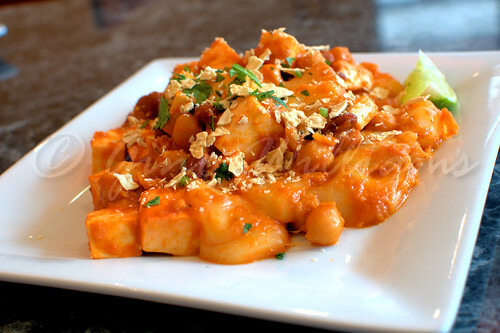 Paneer cubes with rajma beans and chana masala in a rich gravy with more cheese had me wanting an immediate nap. I have always had lentil chat and surprisingly that is lighter than paneer chat. I had to get the remainder for take-away, it was so filling. Next time I shall make a note to order two appetizers only and have the paneer chat as one of them so that I may eat it to completion. Then again, I should have known better after having the same dish in Bangalore, Bombay, and in Delhi. It is a great thing that I saw The Little India Restaurant from the elevated train several weeks ago. This little gem was definitely worthy of the trip to Uptown for sit-down eating. The service was perfunctory at first, very warm after I had placed my order without inquiry or any hesitation. The waitress was rather intrigued as to where I was from. Of course being a part of the global community has exposed me to other cultures and my comfort with eating various foods — within reason, excluding insects, rodents, and plain mayonnaise — I will indulge various cuisines with the best of the ethnic representation. She was quite surprised when I had mentioned that often I have to request my food cultural style with the spices and family style as opposed to tempered for the American palate and heaped in a pile in front of me. A decisive “exotic” who could hold conversation about Indian cuisine — how about that? The price was smashing, albeit all I had were the mango lassi and appetizers. Again, the food was outstanding and delicious enough for a return visit once I find myself in Uptown again. I shall ka — Hindi for eat — until my heart is content, which is all the time. The lasi looks very nice and refreshing. The samos also seem well prepared, so I guess they are pretty tasty too.